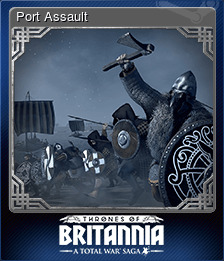 Total War Saga: Thrones of Britannia | Steam | Opium Pulses - Cheap Prices, Great Service. Playing as any faction, ensure that every characters loyalty remains above 1 for the entire campaign. Playing as any faction, complete the main campaign whilst maintaining ownership of your starting regions. Playing as any faction, complete the main campaign without reaching -12 war fervour. Playing as West Seaxe, complete the main campaign by achieving any of their victory conditions. Playing as any faction, complete the main campaign without negotiating peace with any other faction. Playing as any faction, destroy another faction after they break your alliance. Playing as West Seaxe, complete the main campaign by achieving a Short Fame victory. Playing as the Viking Sea Kings, reach the maximum possible tribute level. Playing as West Seaxe, complete the main campaign by achieving a Short Kingdom victory. 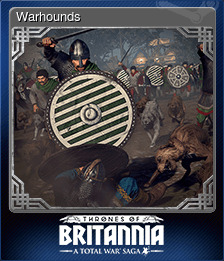 Playing as any of the Welsh kingdoms, complete the main campaign while keeping heroism over 10 and never falling beneath 10. Playing as any faction, complete the main campaign, achieving a Short victory on Hard difficulty. Playing as Dyflin, complete the main campaign by achieving any of their victory conditions. Playing as Dyflin, complete the main campaign, maintaining ownership of Dyflin throughout. 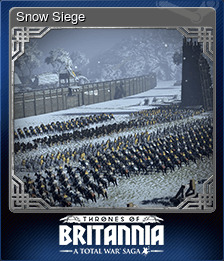 Playing as Gwined, complete the main campaign by achieving any of their victory conditions. Playing as any faction, own all Longphort and Viking Port buildings on the campaign map. Playing as any faction, complete the main campaign and reach max war fervour. Playing as Mide, complete the main campaign by achieving any of their victory conditions. 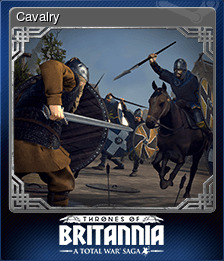 Playing as any of the English kingdoms, complete the main campaign without exceeding the Fyrd’s limit for raised levy units. Playing as Gwined, conquer all Welsh regions. Playing as Dyflin, complete the main campaign by achieving a Short Kingdom victory. Mide? I Hardly Knew Her! Playing as Mide, complete the main campaign by achieving a Short Fame victory. Playing as Gwined, complete the main campaign by achieving a Short Kingdom victory. Playing as any faction, complete the main campaign, achieving a Short victory on Very Hard difficulty. Playing as Dyflin, complete the main campaign by achieving a Short Fame victory. Playing as West Seaxe, complete the main campaign by achieving a Long Fame victory. Playing as Circenn, complete the main campaign by achieving any of their victory conditions. 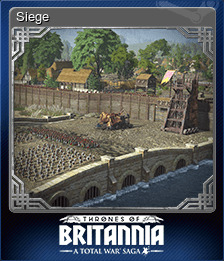 Playing as Strat Clut, complete the main campaign by achieving any of their victory conditions. Playing as Gwined, complete the main campaign by achieving a Short Fame victory. Playing as Circenn, complete the main campaign by achieving a Short Fame victory. Playing as Sudreyar, complete the main campaign by achieving any of their victory conditions. Playing as Northymbre, complete the main campaign by achieving any of their victory conditions. 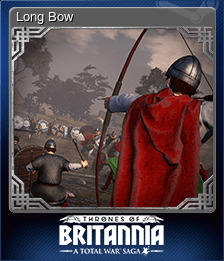 Playing as East Engle, complete the main campaign by achieving any of their victory conditions. Playing as West Seaxe, complete the main campaign by achieving an Ultimate victory. Playing as any faction, own the Rock of Caisil, Mountain Hall, and Offa's Hall buildings on the campaign map. Playing as Dyflin, conquer all Irish regions. Playing as any faction, complete the main campaign, achieving a Long victory on Hard difficulty. Playing as Strat Clut, complete the main campaign by achieving a Short Kingdom victory. Playing as Mide, complete the main campaign by achieving a Long Fame victory. Playing as West Seaxe, complete the main campaign by achieving a Long Kingdom victory. Playing as any faction, conquer all the cities on Nennius' list. Playing as Sudreyar, complete the main campaign by achieving a Short Kingdom victory. Playing as Dyflin, complete the main campaign by achieving a Long Fame victory. Playing as any faction, complete the main campaign, fighting all battles and without losing more than 10 times. Playing as any faction, complete the main campaign, achieving a Short victory on Legendary difficulty. Playing as Mide, conquer all Irish regions. Playing as any faction, achieve a Short victory by fighting and winning every battle. Playing as West Seaxe, complete the main campaign by achieving a Long Conquest victory. Playing as Mierce, complete the main campaign by achieving any of their victory conditions. Playing as East Engle, complete the main campaign by achieving a Short Kingdom victory. 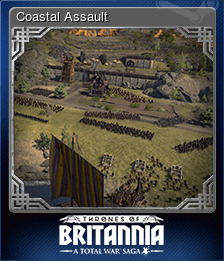 Playing as West Seaxe, complete the main campaign by achieving a Short Conquest victory. Playing as Gwined, complete the main campaign by achieving a Long Fame victory. Playing as Mide, complete the main campaign by achieving a Short Conquest victory. Playing as Northymbre, complete the main campaign by achieving a Short Fame victory. Playing as any faction, complete the main campaign, achieving a Long victory on Very Hard difficulty. Playing as Circenn, conquer all Scottish regions. Playing as any faction, play and win a battle whilst heavily outnumbered. Playing as Northymbre, complete the main campaign by achieving a Short Kingdom victory. Playing as Dyflin, complete the main campaign by achieving an Ultimate victory. Playing as Circenn, complete the main campaign by achieving a Long Fame victory. Playing as Strat Clut, complete the main campaign by achieving a Short Fame victory. Playing as any faction, complete the main campaign, achieving an Ultimate victory on Hard difficulty. Playing as Sudreyar, complete the main campaign by achieving a Short Fame victory. Playing as East Engle, complete the main campaign by achieving a Short Fame victory. Playing as any faction, own all of the Saints' buildings on the campaign map. Playing as Mierce, complete the main campaign by achieving a Short Fame victory. Playing as any faction, marry a rival king's daughter and then destroy his faction through conquest. Playing as Strat Clut, complete the main campaign by achieving a Short Conquest victory. 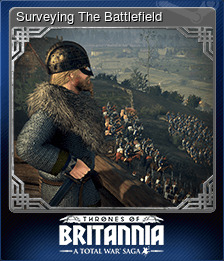 Playing as Gwined, complete the main campaign by achieving a Short Conquest victory. Playing as Strat Clut, complete the main campaign by achieving a Long Fame victory. Playing as West Seaxe, conquer all English regions. Playing as any faction, complete the main campaign, achieving a Long victory on Legendary difficulty. Playing as any faction, conquer all regions on the campaign map in less than 200 turns. Playing as Sudreyar, conquer all Scottish regions. 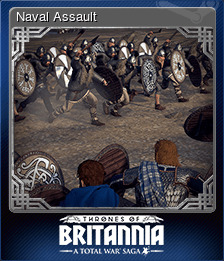 Playing as any of the Gaelic kingdoms, annex all surviving Gaelic factions. Playing as Mide, complete the main campaign by achieving an Ultimate victory. Playing as Dyflin, complete the main campaign by achieving a Short Conquest victory. 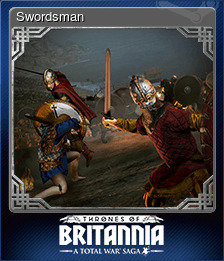 Playing as Gwined, complete the main campaign by achieving an Ultimate victory. Playing as Dyflin, complete the main campaign by achieving a Long Kingdom victory. Playing as Sudreyar, complete the main campaign by achieving a Long Fame victory. Playing as Northymbre, complete the main campaign by achieving a Long Fame victory. Playing as Northymbre, complete the main campaign by achieving a Short Conquest victory. Playing as East Engle, complete the main campaign by achieving a Long Kingdom victory. Playing as Northymbre, complete the main campaign by achieving a Long Kingdom victory. Playing as Sudreyar, complete the main campaign by achieving a Long Kingdom victory. Playing as Northymbre, conquer all Scottish regions. Playing as Strat Clut, complete the main campaign by achieving an Ultimate victory. Playing as Mide, complete the main campaign by achieving a Short Kingdom victory. Playing as Mierce, complete the main campaign by achieving a Short Conquest victory. Playing as Gwined, complete the main campaign by achieving a Long Conquest victory. Playing as any faction, complete the main campaign, achieving an Ultimate victory on Legendary difficulty. Playing as any faction, complete the main campaign, achieving an Ultimate victory on Very Hard difficulty. Playing as Strat Clut, conquer all Welsh regions. Playing as Mierce, complete the main campaign by achieving an Ultimate victory. Playing as East Engle, complete the main campaign by achieving a Long Fame victory. Playing as East Engle, complete the main campaign by achieving an Ultimate victory. Playing as Circenn, complete the main campaign by achieving a Short Conquest victory. Playing as Circenn, complete the main campaign by achieving an Ultimate victory. Playing as Sudreyar, complete the main campaign by achieving an Ultimate victory. Playing as Northymbre, complete the main campaign by achieving an Ultimate victory. Playing as Mierce, complete the main campaign by achieving a Long Fame victory. Playing as any faction, gain a Legendary attacker. Playing as Mierce, complete the main campaign by achieving a Short Kingdom victory. 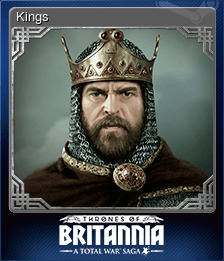 Playing as Mide, complete the main campaign by achieving a Long Kingdom victory. Playing as Circenn, complete the main campaign by achieving a Long Kingdom victory. Playing as any faction, gain a Legendary general. Playing as any faction, gain a Legendary governor. Playing as any faction, gain a Legendary military leader. Playing as Gwined, complete the main campaign by achieving a Long Kingdom victory. Playing as any faction, gain a Legendary defender. Playing as Strat Clut, complete the main campaign by achieving a Long Kingdom victory. 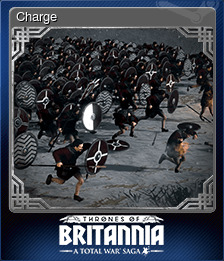 Playing as any faction, complete the main campaign without any rebellions or usurpers challenging your rule. 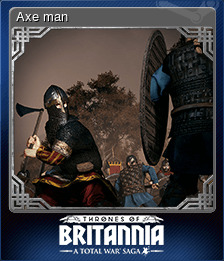 Playing as any faction, complete the main campaign having turned all your enemies into vassal kingdoms. Playing as any faction, achieve a Long victory by fighting and winning every battle. Playing as the Great Viking Army, complete the main campaign while keeping both the English and the Army happy at all times. Playing as Mierce, complete the main campaign by achieving a Long Kingdom victory. Playing as Strat Clut, liberate or ally with all Welsh factions. Playing as East Engle, conquer all English regions. Playing as Mierce, complete the main campaign by achieving a Long Conquest victory. Playing as Mide, complete the main campaign by achieving a Long Conquest victory. Playing as East Engle, complete the main campaign by achieving a Short Conquest victory. Playing as Strat Clut, complete the main campaign by achieving a Long Conquest victory. Playing as Dyflin, complete the main campaign by achieving a Long Conquest victory. Playing as Northymbre, conquer all English regions. Playing as Circenn, complete the main campaign by achieving a Short Kingdom victory. Playing as Sudreyar, complete the main campaign by achieving a Long Conquest victory. Playing as Northymbre, complete the main campaign by achieving a Long Conquest victory. Playing as East Engle, complete the main campaign by achieving a Long Conquest victory. Playing as Mierce, conquer all English regions. Playing as any faction, achieve an Ultimate victory by fighting and winning every battle. Playing as Sudreyar, complete the main campaign by achieving a Short Conquest victory. Playing as Circenn, complete the main campaign by achieving a Long Conquest victory.